Late 18th-century piano music performed on a copy of a period instrument reveals an aspect of the music, be it Mozart, Beethoven, Haydn or their contemporaries, which is masked by the many overtones of the modern piano. The wooden frame, lighter hammers and less string tension allow the instrument to sing with a clearer sound quality and consequently to reveal all the subtleties of the melodic line. Such an instrument is what these composers knew and had in mind when they wrote their keyboard works. Bernard Brauchli’s fortepiano is copied after an instrument built in the 1780’s in Vienna by Anton Walter (1752-1826) which originally belonged to Mozart who in his later years is known to have favoured the instruments of this maker. It was donated by his son Carl to the Mozarteum in Salzburg in 1856. 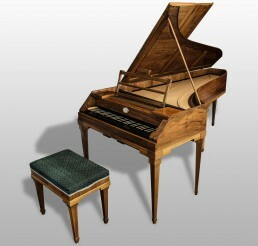 This particular instrument is ideally suited to works by late 18th-century composers and to early Beethoven.